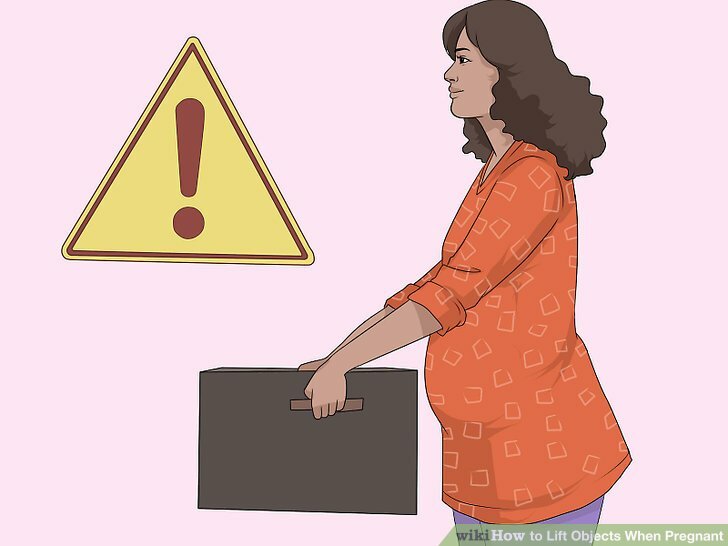 Lifting heavy objects while pregnant is often considered harmful and is not usually recommended. It is easy to strain your back when carrying extra weight, and softer ligaments during pregnancy can make you more susceptible to injury. However, there are times when lifting items is necessary, in which case knowing how to do so properly is a good idea. You will first want to assess the item to determine whether or not you are able to lift alone or if you require help. 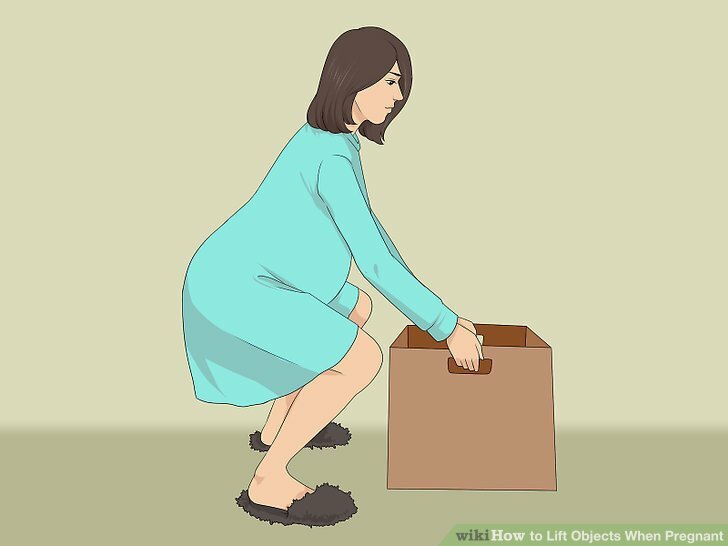 Then, when you lift the object you need to rely on your arms and legs while keeping your back straight. Listen to your body throughout the process, it will give you signs as to what it can and can’t handle. 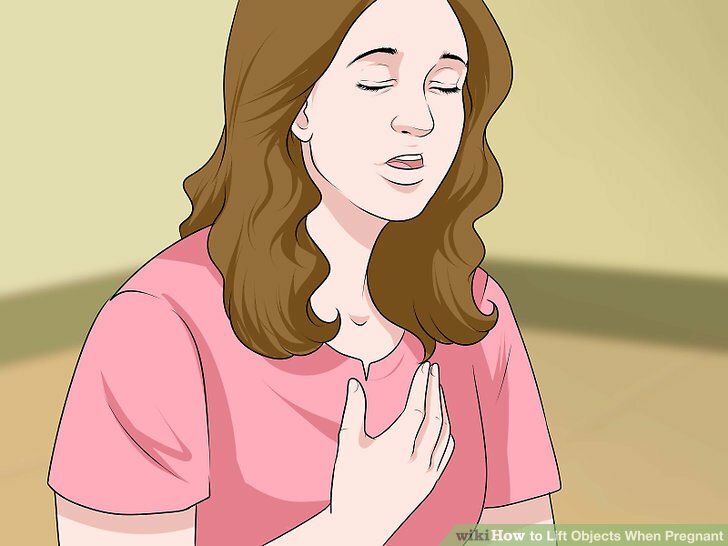 Decide whether you should lift the object in question based on its weight. 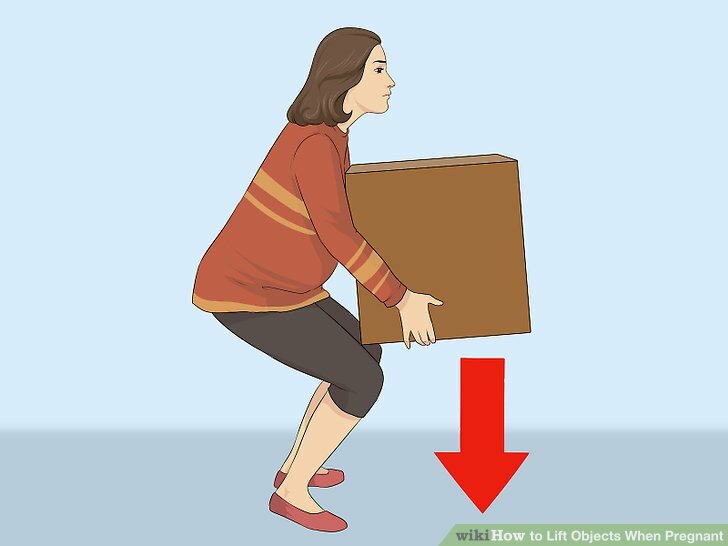 The amount of weight that is generally safe to lift is connected to your stage of pregnancy. 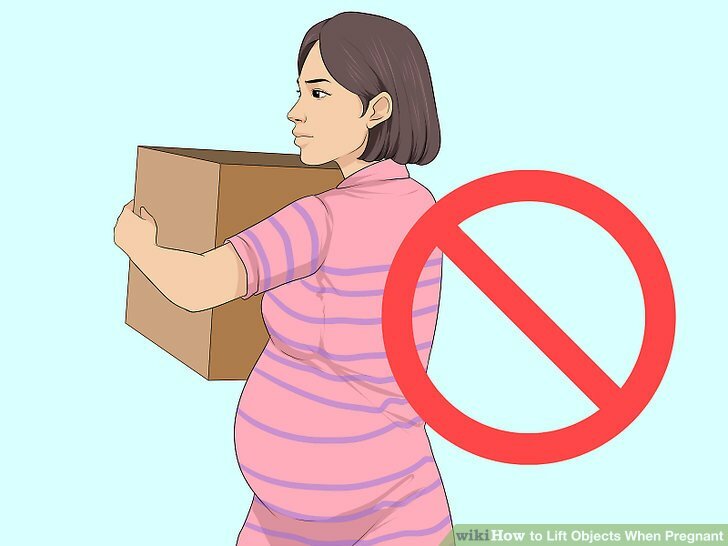 The more advanced your pregnancy, the more you should avoid lifting heavy objects. The frequency of lifting also matters, with occasional lifting being less risky than everyday actions. Up until the 24th week, it is generally okay to lift more than 51 lbs. (23 kg) regularly if needed. However, it is still better if you lift this amount only sporadically if possible. After the 24th week, you should limit any constant lifting to a maximum weight of 24 lbs (11 kg). After the 30th week, you should eliminate any constant lifting and only sporadically lift up to 24 lbs. (11kg), if necessary. Divide or break up the object if you can. When possible, divide large loads of materials into smaller groups or make several trips, rather than carry a heavy load at one time. 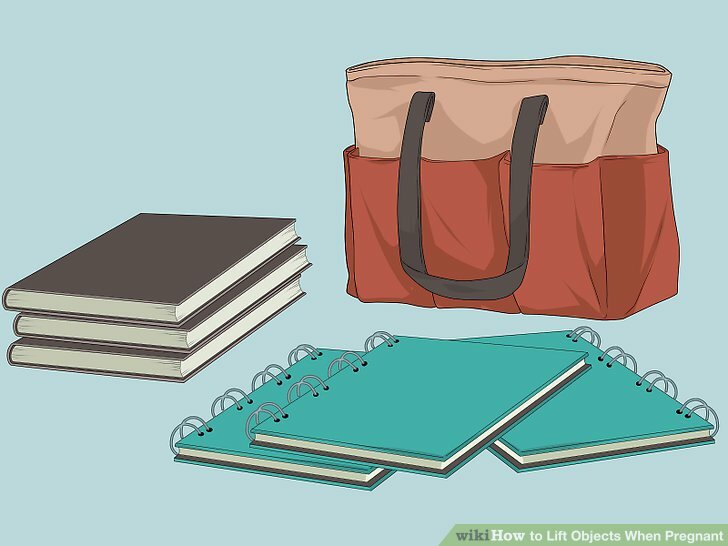 For example, if you have one large box of books, see if you can split it up into multiple carry bags or smaller boxes before moving it. The extra effort could save you from back pain. If you choose to divide the object up into bags, choose bags with handles. They will be easier and more stable for you to lift and move. Also, consider pushing or sliding the object to its final destination before you lift it. This may work especially well with an object that only needs to go a short distance on a smooth surface. Stand in front of the object. 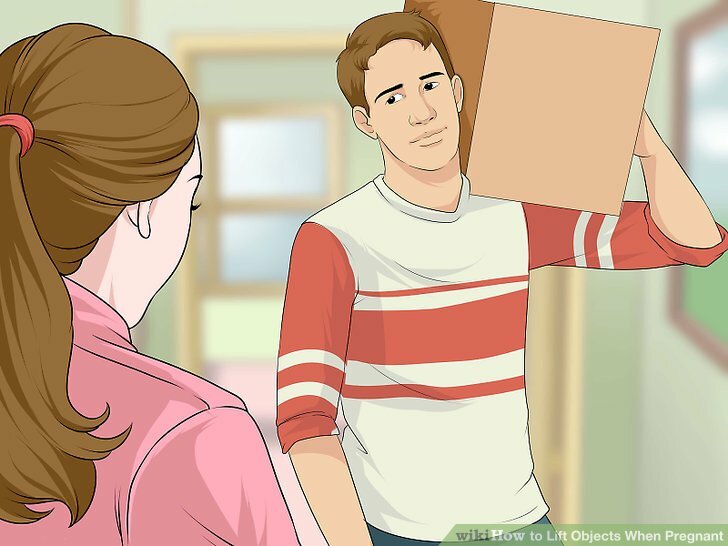 If you do decide to lift the object, position yourself as close as possible to it while standing. Space out your feet about a foot apart or a little more depending on the size of the object. Keep them parallel to one another. Make sure that your feet are stable and planted firmly. 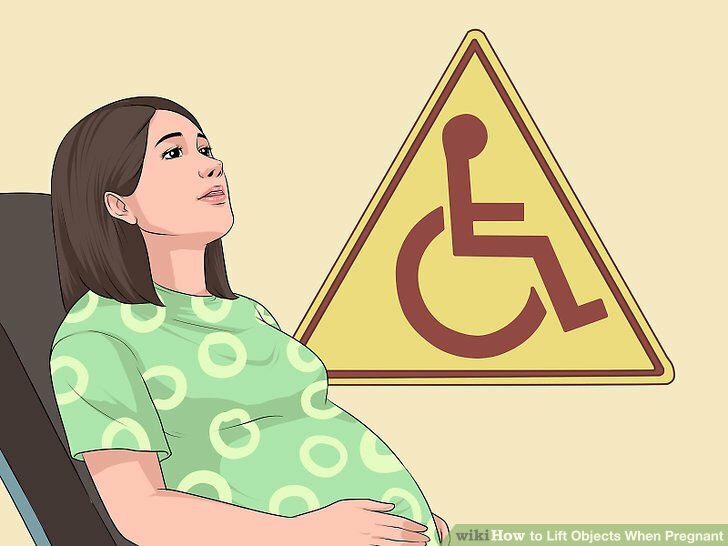 Never lift a heavy object on unsteady ground when pregnant. The shifting ground makes it more possible that you could lose your balance and fall, possibly injuring yourself and your baby. This is especially the case if you are in the latter stages of pregnancy and your balance has shifted forward, throwing off your center of gravity. Assume the squatting or kneeling position. 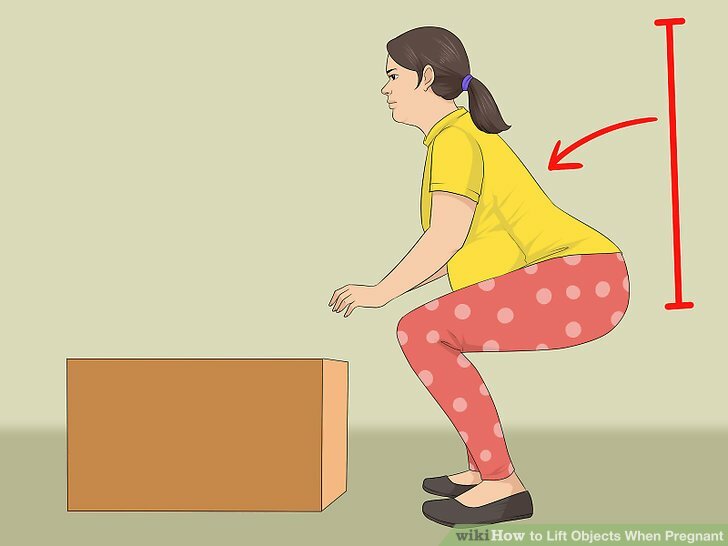 Squat down while standing near to the object. The item to be lifted should be positioned between your knees as you go down. If you need extra balance support, slightly slide one foot forward an inch or two. Or, if your knees need additional support, you can try the kneeling position instead. Kneel down to pick up the object by placing a single knee on the ground for extra balance. Then, when you need to lift up, you can push off this knee for additional power as well. 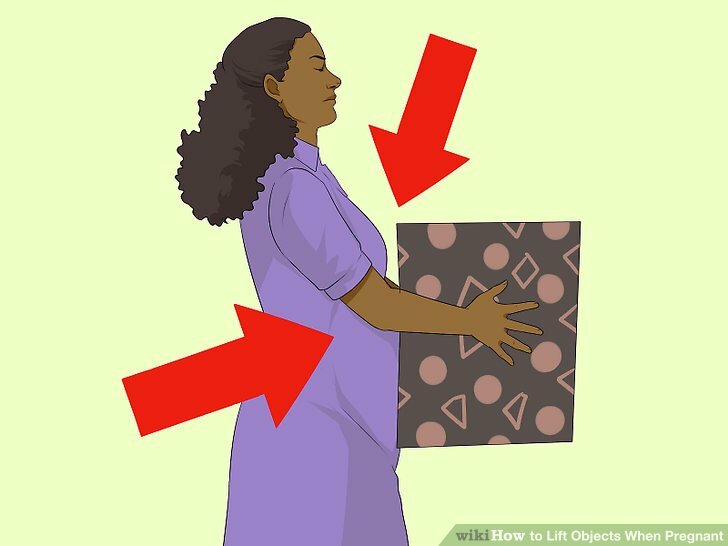 If your belly hits the object at any time, with either position, you are too close and will need to move back slightly. After you’ve gone down into a squatting or kneeling position, if you feel as if you can’t lift the object or even get back up, simply sit down on the ground. It is better to pause for a moment rather than risk injury. No matter which initial position you choose, make sure to keep your spine straight throughout the entire process. Picture a ruler placed against your back and try to straighten to meet it. You could also wear a maternity belt to provide a bit of extra back support. Many pregnant women wear these on a daily basis as they lessen pain by encouraging proper posture and providing lift. Your back is particularly vulnerable to strain due, in part, to a hormone called relaxin which your body produces early on in your pregnancy. It increases the flexibility of your connective tissues in order to prepare your pelvic area for the birthing process. The side effect, however, is that it can weaken the back. Always place both hands on the object, if at all possible. This increases your ability to maintain control over it as you move. Find a good handhold as well, if you can. For example, on a box this may mean using pre-punched handholds on the side or tilting it until you can reach under to grab it from below. If you feel your handhold slipping as you lift, set the object back down on the ground smoothly and quickly. You do not want to risk dropping the object or hitting your belly with it if you lose control. Flex your legs and arms to lift. After you’ve established your grip, it is time to lift. Your legs and arms should do the majority of the work. Tighten them to lift the object and rise slowly into a standing position. If you feel your back tightening, you need to use your legs more. If you are in the kneeling position to start with you can lift the object to the top of your knee first. Then, use the knee on the ground to push upward, taking the box with you as you rise. Keep the object close to you. This is a bit tricky when you have a pregnant belly to work around. But, holding the object near to your body as you lift and move will reduce the strain on your arms. “Bear hug” the object if you can, pulling it to you with both arms wrapped around it. 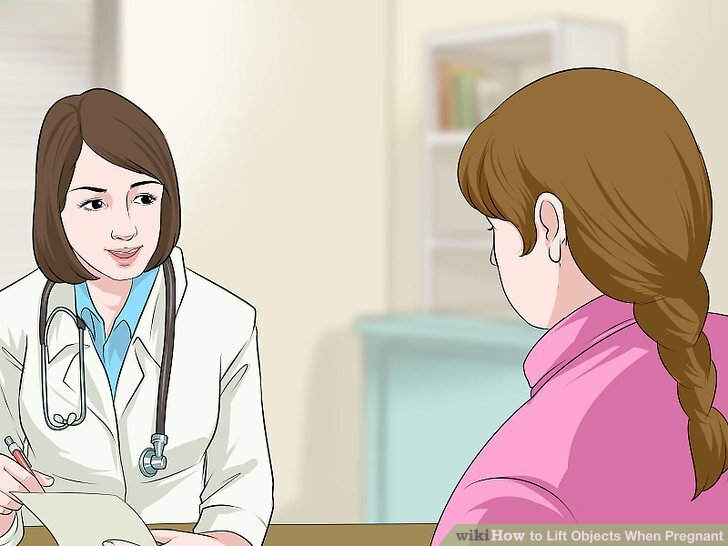 Do not set the object on top of your belly bump at any point during the lifting process. This would keep the object close to you, but could also prove harmful to your baby by placing too much direct pressure on the abdomen. Keep your body facing forward as you lift. Maintain this position even as you move the object. Twisting or turning places weight-bearing pressure on your back and hip areas. 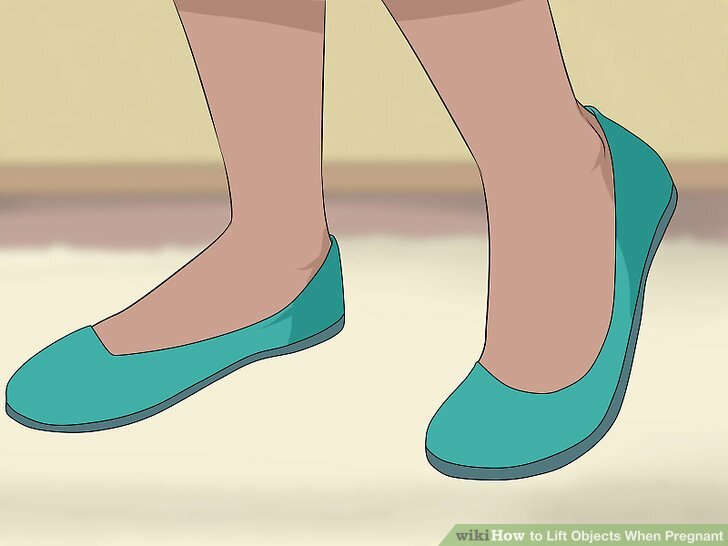 After you’ve lifted the object into a standing position, if you need to head in a direction other than the one that you are facing, rotate your body by leading with your feet, not your spine. Walk slowly when carrying the object. Don’t rush to get where you need to go. Take purposeful, small steps. Watch for any obstructions that may be in your path. Bend to set the object back down. 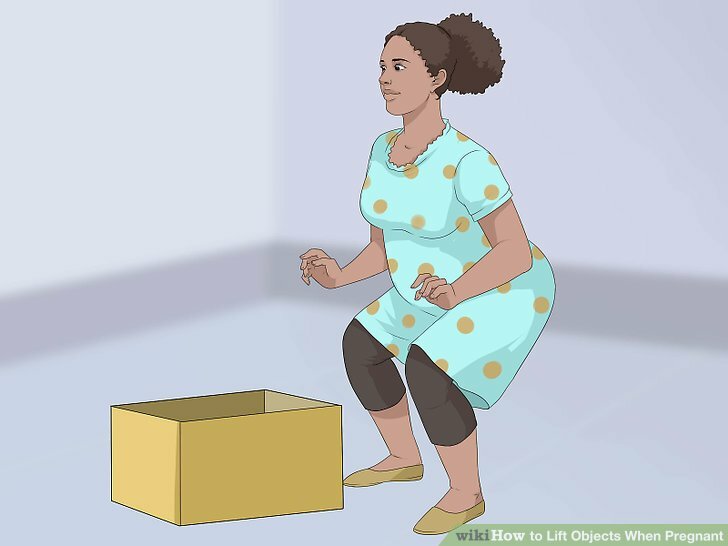 When you are ready to drop off the object, set it down by bending your knees as you lower. Your waist and hip area will bend as well while your back should remain straight. This is essentially the reverse of the lifting position that you used before. You can go down to one knee or squat to place the object on the floor. Watch to make sure that you are not leaning too far forward as you go down. Breathe naturally throughout the entire process. As with any type of weightlifting, it is very tempting to hold your breath at various points as you lift, stand, walk, and set down. It is more helpful, and safe for you and your baby, to maintain a consistent breathing pattern. Call your doctor before engaging in any physical behavior that you believe could be a risk to you or your child. Look at the object, estimate its weight, and explain the situation and your concerns. They will be able to explain the risk factors to you in detail while also giving advice tailored to your specific pregnancy. Pay attention to the unique needs of your pregnancy. Not all pregnancies are the same. If you have had any pregnancy complications that require you to take it easy or to be put on bed rest, such as cervical incompetence, then you may need to modify the suggested weight lifting limits to be more conservative. Or, you may need to abstain from lifting altogether. If you’ve experienced no complications, you may be fine to lift within the given weight ranges until you deliver. 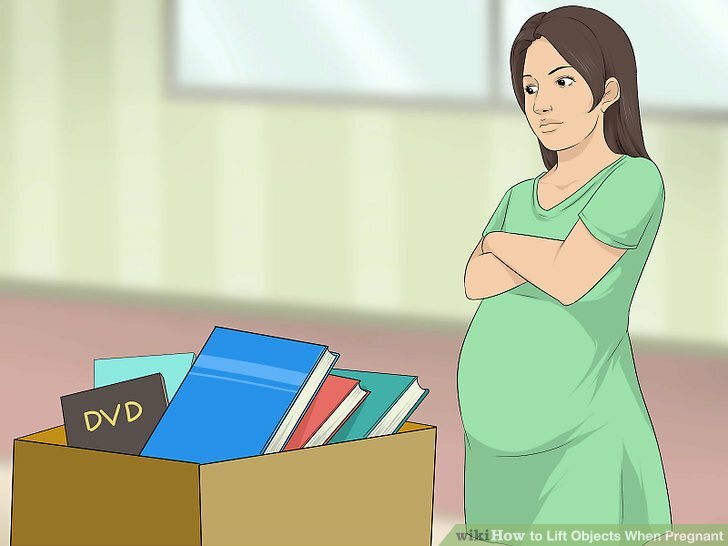 Even if you are used to lifting objects, be aware that moving heavy items more than once every five minutes can increase your potential for premature birth or miscarriage. Ask other people for help. Flag down a co-worker or get your spouse or another relative to assist you when moving items. You can request that you both lift the object together or they may offer to do it entirely on their own. This gets the job done at minimal physical strain to you. You know your own limits better than anyone. You’ve been paying attention to your body’s cues throughout your pregnancy, so do so now as well. For example, if you lifted weights and moved objects frequently prior to becoming pregnant, then your body’s level of tolerance for such actions could be high. On the other hand, if you’ve never moved boxes before, now may not be the best time to start. As a general rule, in late pregnancy, limit your lifting to 20-25% of what you could reasonably manage in a pre-pregnant state. Know your rights if you refuse to lift. There are protections in place for those women who have jobs that require the regular lifting of heavy objects. The Pregnancy Discrimination Act may be something for you to look into if you find that your pregnancy prevents you from completing your job as usual. The standard practice is for you to receive accommodations based on a ‘temporary disability’ status.